It’s not hard to detect meteors: go outside on a clear night in a dark place and you’re bound to see one eventually. But visible light detection is limiting, and knowing that meteors leave a trail of ions means radio detection is possible. That’s what’s behind this attempt to map meteor trails using broadcast signals, which so far hasn’t yielded great results. The fact that meteor trails reflect radio signals is well-known; hams use “meteor bounce” to make long-distance contacts all the time. And using commercial FM broadcast signals to map meteor activity isn’t new, either — we’ve covered the “forward scattering” technique before. The technique requires tuning into a frequency used by a distant station but not a local one and waiting for a passing meteor to bounce the distant signal back to your SDR dongle. Capturing the waterfall display for later analysis should show characteristic patterns and give you an idea of where and when the meteor passed. [Dave Venne] is an amateur astronomer who turns his eyes and ears to the heavens just to see what he can find. [Dave]’s problem is that the commercial FM band in the Minneapolis area that he calls home is crowded, to say the least. He hit upon the idea of using the National Weather Service weather radio broadcasts at around 160 MHz as a substitute. 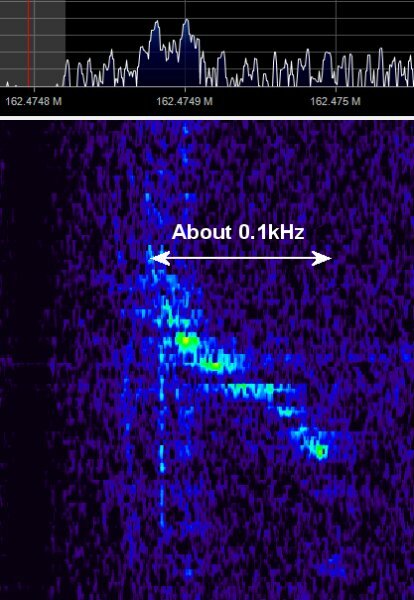 Sadly, all he managed to capture were passing airplanes with their characteristic Doppler shift; pretty cool in its own right, but not the desired result. The comments in the RTL-SDR.com post on [Dave]’s attempt had a few ideas on where this went wrong and how to improve it, including the intriguing idea of using 60-meter ham band propagation beacons. Now it’s Hackaday’s turn: any ideas on how to fix [Dave]’s problem? Sound off in the comments below.